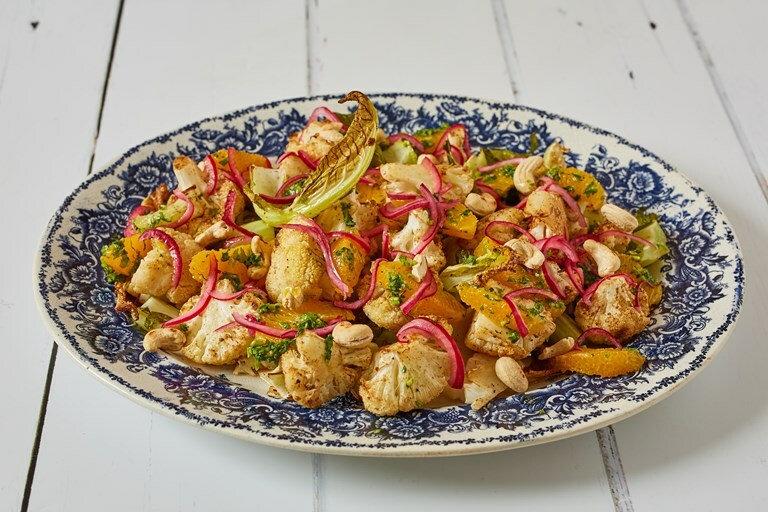 Earthy, gently-spiced cauliflower and sweet, tart orange make excellent bedfellows in this hearty vegan salad, scattered with a handful of toasted cashews for extra crunch and lightly pickled onions for bite and tanginess. There's no need to throw away the leaves and stems – they are just as delicious, if not moreso, than cauliflower florets. In fact, if you have a glut of leaves to use up, you can make this dish with them alone. Read Victoria's feature for further tips on using up veg tops and leaves. Cauliflower and orange might not sound like an obvious pairing, but trust me: the heat and nuttiness of the roasted cauliflower makes the perfect contrast to the sweet, citrus tang of the orange. It also works wonderfully with mandarins, tangerines, or any other small orange. If you pick up a cauliflower with lots of leaves on it, you can use just the leaves in this warm winter salad and save the florets for another meal. You can also save the orange skin to make candied peel or shichimi togarashi.